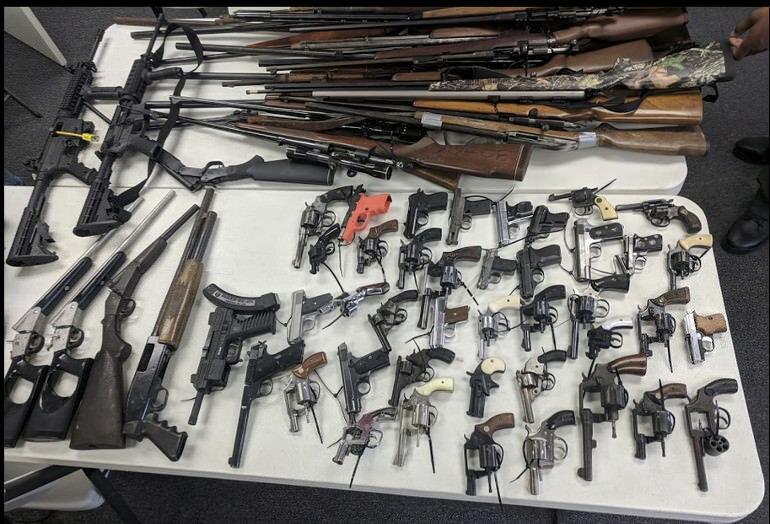 The image [below] is of the 73 firearms turned in on the 30th of June, 2018, in Montgomery, Alabama. While there are many inexpensive firearms on the table, there are some classic and expensive collector items as well. I see a Hi Standard Model B .22, a Beretta pocket tip up model, a Smith & Wesson Victory model, and a Colt pocket auto.32. One of the “assault weapons” is a Mossberg 715T, which is an straight blowback Mossberg .22, dressed in a plastic shell to make it look like an AR15 clone. There is an actual AR15 clone and Tec .22. There appears to be a pre-64 model 70 Winchester in 30-06. There are interesting old pocket pistols, and a classic model 60 S&W in stainless steel. CrimeStoppers’ Gun Buy Back program paid people $100 for assault weapons and $50 for pistols. “We’ve had everything from AR-15’s to 22 pistols, shotguns, some are guns that people want to get ride of because they had younger kids around the house,” says Garrett. 67 guns were turned in during last year’s 2 hour gun buy back. Serial numbers of the guns they are buying back so see if the gun was used in a crime. Organizers of these events have become conflicted about how much they advertise them. If the event become well known, private parties show up to purchase the valuable guns, benefiting all concerned, but destroying the propaganda message of the event. I did not see any coverage of private purchasers at this event. That is likely why so many valuable guns were turned in for so little in recompense. From 10 a.m. to 1 p.m. on Saturday, anybody with unwanted firearms could sell them to CrimeStoppers for up to $100 cash per weapon. Garrett said the next gun buyback event will be held June 29, 2019. How much did they pay for each gun? Next time they do this I’ll set up a stand next to theirs and offer five dollars more for each gun that I accept. Of course I reserve the right not to buy rusty junk–which is what usually is brought to these buybacks. If private parties had been there, it is hard to believe they wouldn’t have paid a couple of hundred dollars for that AR clone, the Smith & Wesson model 60, the classic Colt pocket .32, or the pre-64 30-06. I love the land, and most of the people, but I am afraid the bill of rights and the gospel has little sway here. Like Deon…. Im out…..
Koyote, have you located a better place? Somewhere more accommodating for your likes? Every time I read about buy-backs it turns my stomach. First off, Tony Garrett, you get to go on the list for being a traitor to your people, and may god have mercy on your soul at your future hanging, (Or maybe firing squad is more appropriate for a gun hater who carries a gun) as we the people shall not. 2nd, What the fk are you buying back exactly?, at what point were these guns purchased by your agency et al., and “If” as is stated in this article, one of these guns was used in a crime, wouldn’t “You” actually be responsible, by your own words…..
And I too would like to know when they perfected pre-crime, and even if they did, it’s still a violation of our Bill of Rights! So all the state mercenaries calling themselves officers brought there guns in for a picture op just to make the claim that people really are turning them in for 3/4 of a tank of gas. The Communist Cops will use them as “drop guns”!